After a 16-foot beam of a Japanese Shinto Shrine washed ashore in Oceanside in March, a very similar 14 foot object has now washed ashore in Florence. The wooden beam or kasagi appears to be the top part of another Shinto shrine- of which Japan has approximately 80,000- represents a spiritual relic for the Japanese culture. Even though not all Japanese citizens practice the Shinto religion, Shinto shrines are culturally unique structures that are found in many important natural areas across the country. 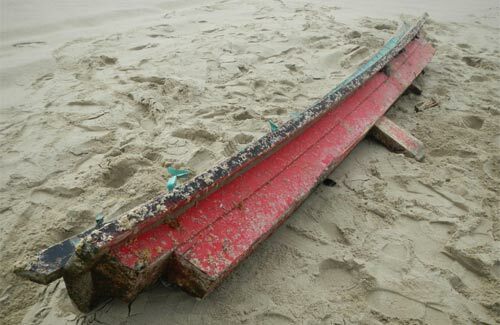 The kasagi beam washed ashore near the Siuslaw River this week. The Japanese Consular Office in Portland has been contacted, but the situation will likely be deferred to Jinja Honcho, the Japanese Association of Shinto Shrines. A 21-foot boat has washed ashore in Crescent City, California, making it one of the first larger objects to wash ashore south of Oregon. The boat is covered in thousands of pelagic gooseneck barnacles (Lepas anatifera), a common oceanic colonizer, giving it a very odd appearance. Once some of the barnacles were removed, the Japanese lettering for "Takada High School" was apparent- the high school was in Rikuzentakata City, which was heavily hit by the tsunami. The boat is currently being verified as tsunami debris, but it likely originated from the natural disaster. I will post more information as it is available. Finally, NOAA has updated the GNOME tsanami debris model for the first time since early March. As larger objects wash ashore on the west coast of North America, the projected critical mass of the debris moves towards US shores. Click on the map for a larger version on NOAA's webpage.